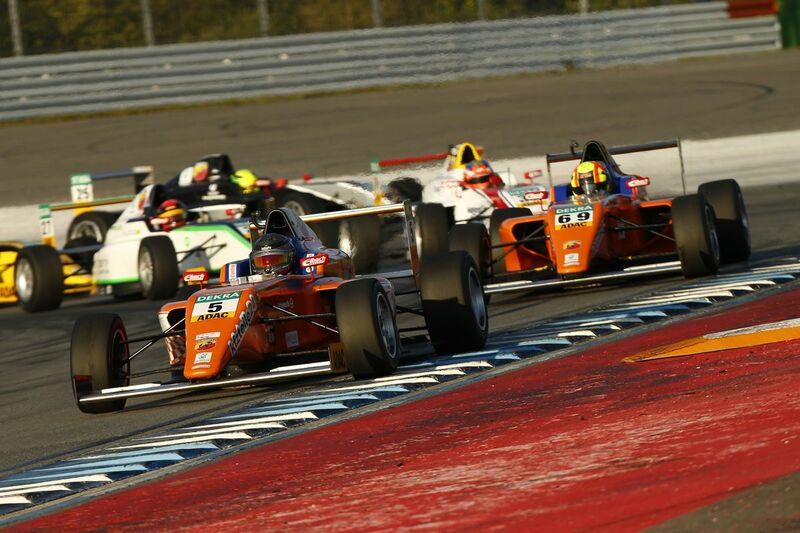 Second race, second championship decision in the finale of the ADAC Formula 4 at the Hockenheimring. David Beckmann (15, DEU, kfzteile24 Mücke Motorsport) clinched overall victory in the Rookie championship on Saturday ahead of time. The 15-year-old can now no longer be beaten on points in Sunday’s last race in the class which is reserved for young talents with no previous motor racing experience. Marvin Dienst (18, DEU, HTP F4 Junior Team UNGAR) had previously secured victory overall in the championship before season’s end in the first race around the Hockenheim circuit. Beckmann won the second race from Lando Norris (15, GBR, kfzteile24 Mücke Motorsport) and the Australian Mawson Joey (19, AUS, Van Amersfoort Racing). This was the maiden win in the ADAC High-Speed Academy for the kfzteile24 Mücke Motorsport youngster. So, Beckmann continued his successful weekend at Hockenheim. The ADAC Sports Foundation protégé had already secured second place behind Dienst in the opening race on Saturday afternoon. Beckmann and Norris battled for victory on the last lap. This led to a collision in which the British driver lost control of his car and rolled. Norris was unhurt but taken to a nearby hospital for the obligatory check-up. The race was red-flagged. After the stoppage, points were then awarded according to positions on the penultimate lap in line with race regulations. 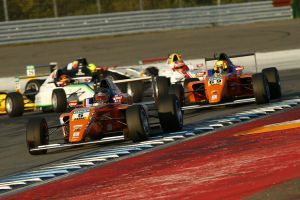 “I’m pleased with my maiden win in the ADAC Formula 4,” said Beckmann after securing a third podium in his debut season in the series. “But I thought it would be a bit different to how it turned out.” After 23 out of 24 races, he leads the rookie championship on 371 points. His closest pursuer, Mike Ortmann (15, DEU, kfzteile24 Mücke Motorsport) could finish no higher than 14th, which puts him on 327 points. Mick Schumacher (16, DEU, Van Amersfoort Racing) added to his points tally with a P5 finish and is third in the table on 272 points. These scores can no longer be surpassed, so the Top Three in the 2015 rookie championship has now been decided. Beckmann has built on his excellent start to a career in professional motor racing by winning the rookie championship. After lifting the winner’s trophy in the 2014 German Junior Kart Championship, he decided to enter the ADAC Formula 4. However, he had to miss out on the season opener at the etropolis Motorsport Arena Oschersleben, because he did not celebrate his 15th birthday until the following Monday – a requirement under the rules governing ADAC Formula 4. In the race weekend that followed at the Red Bull Ring in Austria, Beckmann then drove to a podium finish on his very first outing in the series. Behind Beckmann and Norris, Mawson in P3 kept his chance alive of claiming the runner-up trophy for the 2015 season. The Australian is in third place on 272 points. Joel Eriksson (17, SWE, Motopark), who is currently second in the table, has been having a problematic weekend so far at the Hockenheimring. After finishing the race in eighth position, he now has 284 points. P4 for Dienst was enough to take his points tally up to 347. The destination of the runner-up trophy will be decided in the last race of the 2015 season on Sunday (live coverage on SPORT1 commences at 16:00 CEST). Mawson will be in pole position while Eriksson will be starting from 17th.